You may link up any number of posts on the following: tips on teaching ___, printables and worksheets, subject-specific activities, examples and projects, self-made curricula (free or for sale), book ideas, scope & sequence, and anything that a homeschooler would reference to teach a particular subject or topic. Remember to link to a specific post. If relevant, feel free to post in multiple categories. Please do not post giveaways, temporary sales or discounts, affiliate links, link-up parties, etc. All titles should follow the same format: (choose one: Preschool, Elementary, Middle, or High) Title. E.g. (Preschool) Pirate Letters. I reserve the right to delete any link up that I deem inappropriate or irrelevant. 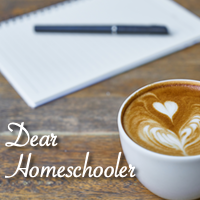 By linking up, you are giving me permission to publish and display your images and links on Dear Homeschooler’s website and all affiliated social media. Support your fellow bloggers by visiting at least one post within the subject category you posted. I would greatly appreciate it if you followed me in some way: Subscribe, Facebook, Pinterest, Twitter. Link-back in some way and share to help spread the word of this helpful resource. Back to Bookshelf Main Page.